SEOUL -- President Moon Jae-in again pressed conservative opposition parties to ratify his April summit agreement with North Korean leader Kim Jong-un Wednesday. 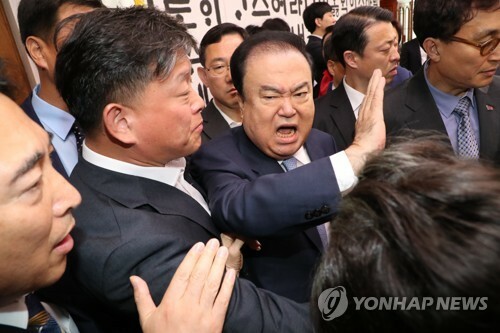 "Conditions on the Korean Peninsula are fast moving forward but the National Assembly is standing still while it fails to even refer the bill on the ratification to the related parliamentary committee," the president said in a weekly meeting with his aides at his office, Cheong Wa Dae. SEOUL -- The National Assembly kicked off its 20-day audit of government agencies Wednesday, with the Moon Jae-in administration's policies on North Korea and the economy likely to come under scrutiny. SEOUL -- BTS became the first Korean musicians to receive a prize at the American Music Awards (AMAs) on Tuesday (local time), the group's management agency said. The popular band won the Favorite Social Artist award at the 2018 AMAs held at the Microsoft Theater in Los Angeles, beating out big-name artists such as Cardi B, Ariana Grande, Demi Lovato and Shawn Mendes, Big Hit Entertainment said. SEJONG -- South Korea's finance minister will attend international meetings this week to discuss pending economic and financial issues with his counterparts from the world's major economies, Seoul's finance ministry said Wednesday. Finance Minister Kim Dong-yeon is scheduled to leave for the Indonesian resort island of Bali later in the day to participate in the G20 Finance Ministers and Central Bank Governors meetings slated for Thursday, according to the ministry. SEJONG -- Transactions among affiliates of South Korea's large business groups rose slightly in 2017 compared to a year earlier due to a rise in the number of conglomerates subject to strict regulations aimed at curbing insider trading, the country's corporate watchdog said Wednesday. A total of 191.4 trillion won (US$169 billion) worth of inter-affiliate deals by 1,779 units of 60 conglomerates were made last year, up 38.9 trillion won from a year earlier, according to the Fair Trade Commission (FTC). SEOUL -- The South Korean government is reviewing whether to lift a set of bilateral sanctions against North Korea, Seoul's top diplomat said Wednesday. SEOUL -- South Korea on Wednesday brushed off concerns that the recent resumption of tap water supply to a liaison office in North Korea violates global sanctions imposed on Pyongyang for its nuclear and missile provocations. A local daily newspaper reported earlier that the Seoul government recently resumed operation of water purification facilities in the North's border town of Kaesong and started to supply tap water to the office opened by the two Koreas in mid-September. It added that the water is also being provided to North Koreans living nearby.